This should bring back happy - or indeed unhappy memories for past pupils of Hopefield Secondary School. 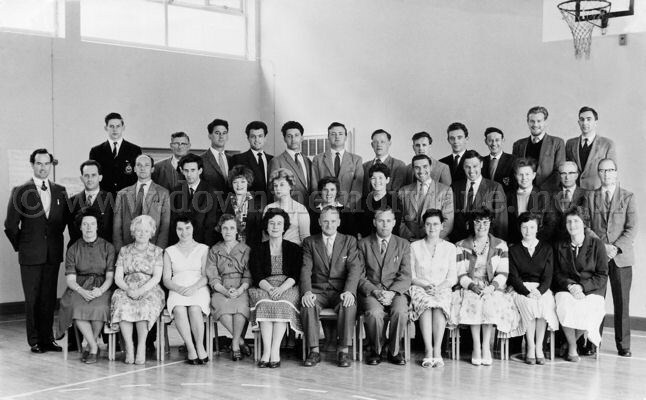 Here we have the teachers of the school back in the 1961. The back row are Unknown, Unknown, Unkown, Hugo Simpson, Alan Bailie, Unknown, Noel Hunter, Billy Galway, John Gorman, Cyril Mackey, Clive McKnight and Hugh Speers. The Middle has Hugh Munnis, Unknown, George McMurray, John Breakey, Joan Kirk, Barbra Ainsley, Rosemary Andrews, Frances Carson, Bobby Jones, Willie Watterson, Tom Nicholl, Mr. Johnston and Ronnie Curran. Seated are Nesta Clutton, Mrs. Monahan, Amy Cunnamion, Mrs Morton, Isa McDowell, Jim Black Headmaster, Jim Nevin, Beth Campbell, Pam Guss, Martha Kidd and Unknown. and that is the Headmaster J.G.Black and 3rd from the right in the 2nd row Tom Nicholl.